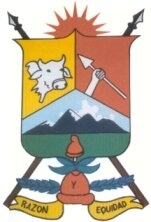 Flag and Coat of Arms are at <pazdeariporo-casanare.gov.co>. The current flag as corrected on Sep 2012 in Wikipedia, supposedly after input from locals and others who know this flag in the cloth, considering Wikipedia’s wide reach and exposure. This image shown reflects an older version of its original at the Wikimedia Commons website; see history. The original report of a 1:2 flag with a brown arrow head on yellow background and with a green hoist triangle was later substantively corrected to a 2:3 flag with a red arrowhead (the other changes being non-essential).